After purchasing the new flooring materials for your house, you are probably very excited to see them installed already. Who wouldn’t be? To see your floor with a fresh design is like looking at yourself after a makeover. However, don’t get too excited yet. You still need to prepare your home properly for the installation. Doing so will make the installation much easier and will lead to best results. Here are the best ways to get your home ready for flooring installation. The first thing to do is remove all the things that can get in the way when the installation is underway. Move the pieces of furniture, fixtures, and appliances to a temporary place. Check if there are wirings that might get hit. Secure them properly or better yet, detach them first. If you have a TV, sound system and hanging shelves, consider removing them as well. Lastly, doors often cause difficulty in floor installation, so detach them for the meantime. Once the rooms are clear, you have to clean it thoroughly. Dust, dirt and small particles will hinder accurate flooring installation, that’s why making sure that the rooms are free from these things is important. Also, ensure that the base floors are smooth, dry, and free from things like molds. Baseboards are the vinyl or wooden boards installed to cover the joint between the flooring and the wall surface. Although you can cut through them and install the ceramic tiles or hardwood flooring underneath, removing the baseboards is the more ideal. It will ensure faultless installation finish and it will also give you a chance to install new baseboards that will blend well with your new flooring. If you have concrete floors, chances are they are rough, uneven, or have damages that can prevent proper floor installation. A subflooring layer will solve this problem. Subfloors are usually ½ or ¾ inches plywoods that will provide flat and even surface for the flooring materials. Subfloors are also installed in other types of base floors to provide firm and stable flooring surface to handle heavy furniture and other objects. Vinyl, tile, hardwood, and stone flooring materials have to be cut to fit the sides and corners of your rooms. Before they are even delivered to your home, you should have already prepared a separate place to do the cutting. It must be outside your home and make sure that the dust will not get in, especially to the rooms where you will do the floor installations. Do-It-Yourself (DIY) projects are very popular nowadays. With many Youtube videos available on flooring installations, you may have considered installing the tile or vinyl flooring. Although it can reduce the total cost of your home floor renovation, you also might not get the results that you wanted. This will lead to redoing the installation and you will end up spending more. Consider getting help from expert installers who have years of experience in flooring installations. Ask your flooring retailer if they have one among their staff or look for independent installers around town. 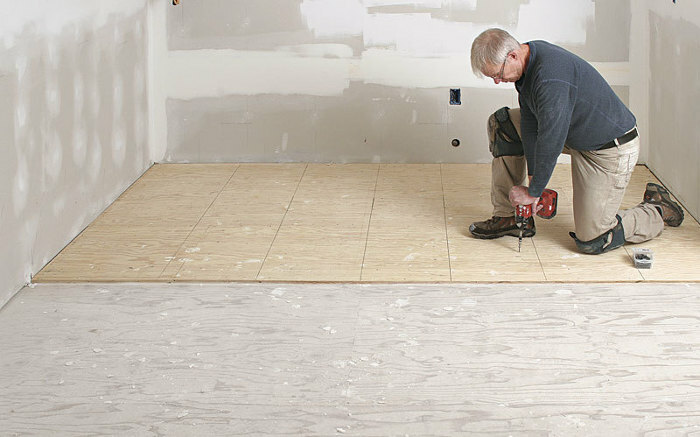 When preparing for flooring installation, there are no shortcuts. You must do it properly and you must not get contented with half-done. By following these tips on how to prepare your home for flooring installation, you will be assured of the best outcome, which is perfect and magnificent new home flooring.